No registration will be accepted after January 31. Online submission is the only way to register. There will be no paper registration form. Beginning January 1, 2019 the online registration link will appear at the bottom of this page. Please read the Prospectus carefully before you register. Eligibility: Open to all photographers working in traditional, digital or combination of both. 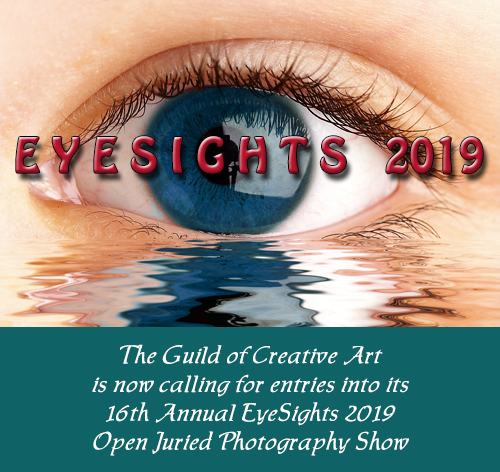 Entry and judging categories: Monochrome and Color photography. No photographs previously shown at the Guild will be accepted. All elements in a composite image must be the original work of the submitting artist and may not incorporate photographic elements produced by anyone else. All entries must have originated with a camera. However, computer generated textures and other software enhancements may be used to complement the photographic image. The Guild has the right to reject objectionable and non-conforming images. Submittal: All entries must be submitted online as digital jpg image files. The judge will review the digital jpg images to select those suitable for conditional acceptance to exhibit in the show. The final Award judging will be based on the actual photographs on display in the exhibit. Up to 3 images may be submitted. Based on the judge’s decision and subject to exhibit space availability, all of your entries may be accepted. Note: Incorrect naming could result in disqualification. The online submission period is from January 1 to 31, 2019. Online submission is the only way to enter – there will be no paper registration form. Acceptance: The judge will review the submitted jpg images and select those that are to be exhibited in the show—these are the conditionally accepted1 photographs. On February 12 a list of artists and artwork conditionally accepted into the exhibit will be posted on the Guild’s website guildofcreativeart.org. 1Final acceptance is contingent on the jpg you submit being an accurate representation of the work you deliver, have excellent print quality, and meet all of the requirements described in this Prospectus. Delivery of Conditionally Accepted Artwork: All work must be hand delivered to the Guild on Wednesday, February 27, between noon and 7 pm. Though not required, for the best presentation you are encouraged to use a white mat for framed work. Works must not exceed 48″ on any side (including multi-panel works.) Works must be suitably framed, wired and ready for hanging. No alligator clips or table top frames allowed. Framed pieces over 36 inches in any direction (including the frame outer dimensions) normally displayed under glass must have Plexiglas instead of glass. Wraparound canvas must be printed on all sides, without exposed staples. Work shall not exceed a maximum weight of 25 pounds. Non-conforming work will be rejected at the discretion of the receiving committee. All artwork must be for sale and remain until the show ends. The Guild receives a 33 1/3 % commission on all sales. Insurance: Please note: The Guild of Creative Art specifically disclaims any liability for the loss, damage, or theft of any artwork exhibited or stored on its premises. Artists are responsible for insuring their own work from delivery to pick-up and return to artist. Judge: Lisa Tice, renowned New Jersey professional portrait photographer. Click HERE for her bio. Additional awards to be announced. All award winners will receive medals. The judge will make awards based on the actual framed artwork submitted, not on the jpg.